MerchmakrTM water-based ink for screen printing offers artists a richer palette with better coverage, a softer hand, and easier cleanup. It doesn't dry as quickly in the screen, improving the screen printing experience over water-based inks from other manufacturers. Compatible with all screen printing systems, including Merchmakr and Yudu. Prints well on many fabrics, paper, cardboard or wood. 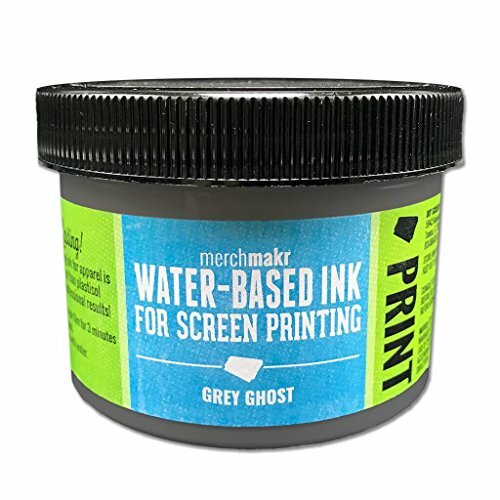 MerchmakrTM water-based ink for screen printing is a ready-to-use, specially formulated non-flammable, PVC- and phthalate-free eco-friendly water-based screen printing ink. It can be used on 100% cotton, 50/50 poly/cotton blends, and some 100% polyester fabrics. For best results, always use a white underbase on dark fabrics. Durable and washfast on textiles when properly set with heat. Can be screen printed or painted on with a brush. Do not let Waterbased inks dry in your screen. Temperature and humidity may affect how fast the ink dries. You may want to use a flood stroke to give you extra time between prints. You may lightly mist ink in screen with water to help prevent drying in the screen. Important Note: If you want your Waterbased ink to be wash-fast, you must make the entire body of the ink reach 320ºF for 2-3 minutes. Contains no harmful chemicals or toxic substances as known to the State of California to cause cancer, birth defects or other reproductive harm, at levels which would require a warning under the California Proposition 65 (Safe Drinking Water and Toxic Enforcement Act of 1986) law. Durable and long-lasting when properly cured. If you have any questions about this product by Merchmakr, contact us by completing and submitting the form below. If you are looking for a specif part number, please include it with your message.